As a Java developer I have learned to appreciate Test Driven Development (TDD). It helps you to deliver quality software solutions and it gives you confidence when you make changes later on. Your test code will help you to make sure that no regression arises when changing your production code. When working with ESB products you work on a different abstraction layer. You are more focused on configuring a message flow, detailing how a specific type of message needs to be routed, transformed, filtered and delivered. You are not as close to the code as a java developer hence it is more difficult to test the complete flow. In addition to that, ESB products are very focused on connectivity to for example an Oracle Database or a SAP backend system. This makes it even more difficult to test because it requires these external systems to be available during testing and also to produce predictable results. 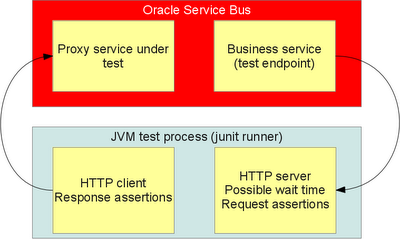 Oracle Service Bus (OSB) is such an ESB. I will not go into depth about the product here, but important to know is that it is very much oriented towards Web Services and XML. These standards will help us to test our integration logic. The business service it invokes is configured with a test endpoint. An embedded HTTP server is used for this purpose. 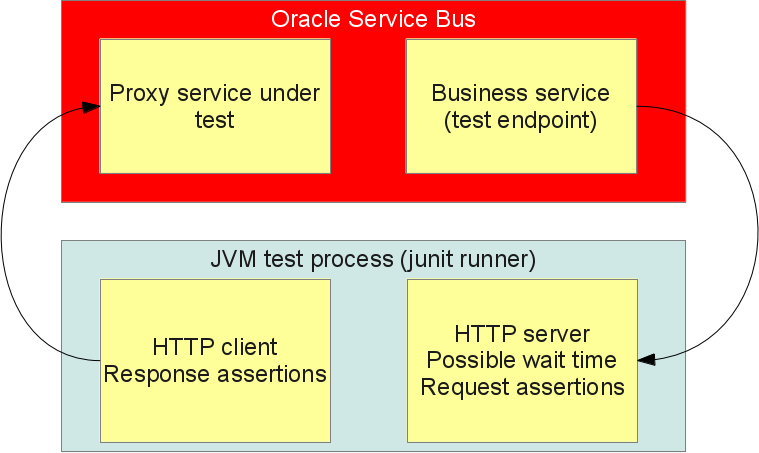 The test endpoint can assert the incoming request, wait for a configured period of time and return a configured response. OSB will return a response to the test client as well, which can then in its turn assert the response. Java libraries used in this setup: JUnit, XMLUnit, Hamcrest, Jetty HTTP client and server. First question to expect is of course: why the custom code and not SOAP UI? I can let it wait so that OSB will not have a response in time; allows me to test the exception handling and retry mechanisms. I can also assert the request that comes from OSB to make sure it is as expected. In case I have to call multiple business services I can have one service return a sucessfull response and have another one time out. All this more complex testing is a lot harder, if not impossible, to configure using SOAP UI.